"My right hip flexor is really sore. Its been playing up for the last few weeks when i go for a run. Its not over-use though because im only running about 3 times a week. But its noticeably worse when i run uphill. and then when i stop running it really hurts just when walking or when i commence running again. Do you think it could be due to doing hard runs when unconditioned? and perhaps straining my muscles when uphill running due to working hard? Hard to stretch it out aswell....it doesnt really seem to feel like it is doing anything. Could it also be due to the surrounding muscles being weak or tight? perhaps my quads?" The problem is unlikely to be due to weakness but there certainly could be a problem with tightness. 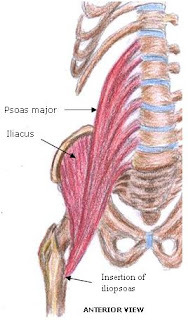 The most likely muscles to be affected are the iliacus and psoas major muscles which can go into spasm from the combination of exercise plus long periods spent sitting (Mary is a student, so spends many hours sitting). 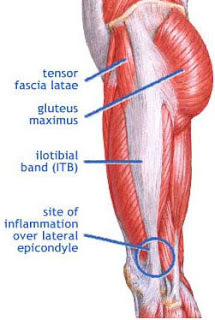 The other muscles most often suspect are the tensor fascia, or any of the thigh muscles that attach to the front of the pelvis, or the gluteus medius, all of which detest long periods of sitting following exercise. The solution is a combination of regular exercise, stretching to give a break from sitting and deep tissue massage about once a week. The massage will be particularly effective. Massage not only the area that is most effective, but also the entire musculature about the hips and thighs right down to the knee and as high as the lower back. The two problems with getting deep tissue massage is finding a decent therapist who knows what they are doing and then being able to afford it once a week. A good therapist may go for about $120 per hour or more. Here are two sets of exercises that can be done daily and to break up sitting far too long!